De Lindehof can be found just a few steps aways from Nuenen's reformed church, immortalised in paintings and drawings by Vincent van Gogh, most famously in his 1884 painting called "Congregation Leaving the Reformed Church in Nuenen", returned to the Van Gogh museum in 2016 after it had been stolen 14 years before. De Lindehof was opened by chef/owner Soenil Bahadoer (b.1967) in 1995 with his then business partner/maître d'hôtel Frans Knaapen. Together they ran the restaurant for 10 years until 2005, when Knaapen left De Lindehof and Bahadoer became its sole owner. Soenil Bahadoer, born in Surinam and from Hindustan descent, moved to the Netherlands at the age of eight, around the time of Surinam's independence. 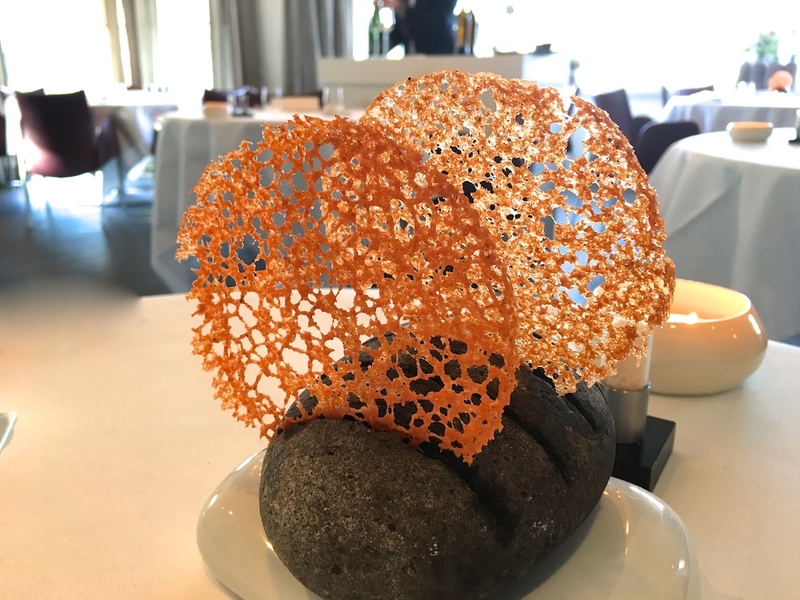 Before opening De Lindehof in Nuenen, he trained alongside Cees Helder at Parkheuvel (then 2 Michelin stars) in Rotterdam and Roger Souvereyns at Scholteshof (then 2 Michelin stars) in Stevoort, Belgium, amongst others. 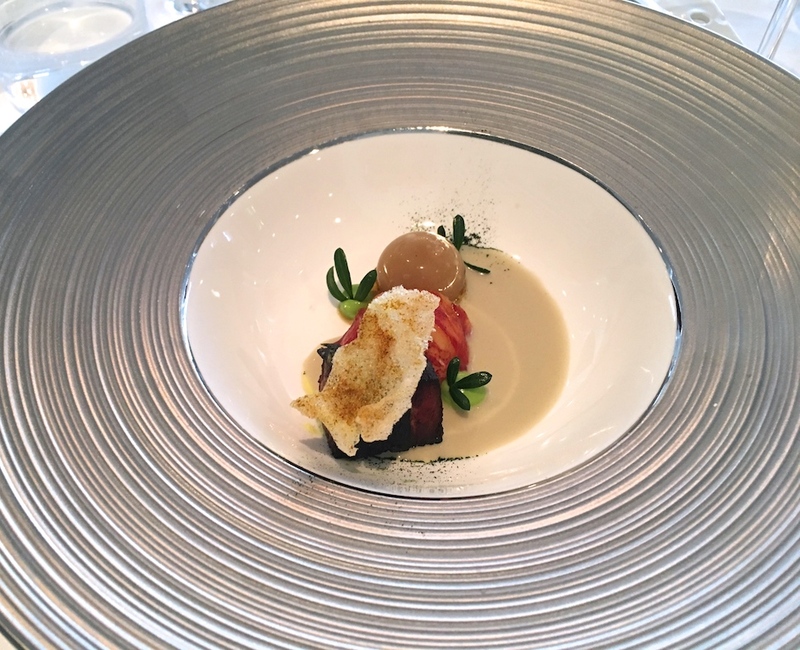 De Lindehof was awarded its first Michelin star in 2004, a second star followed in 2014 (2015 guide). De Lindehof is open for lunch and dinner Thursday through Monday (no lunch on Saturdays). 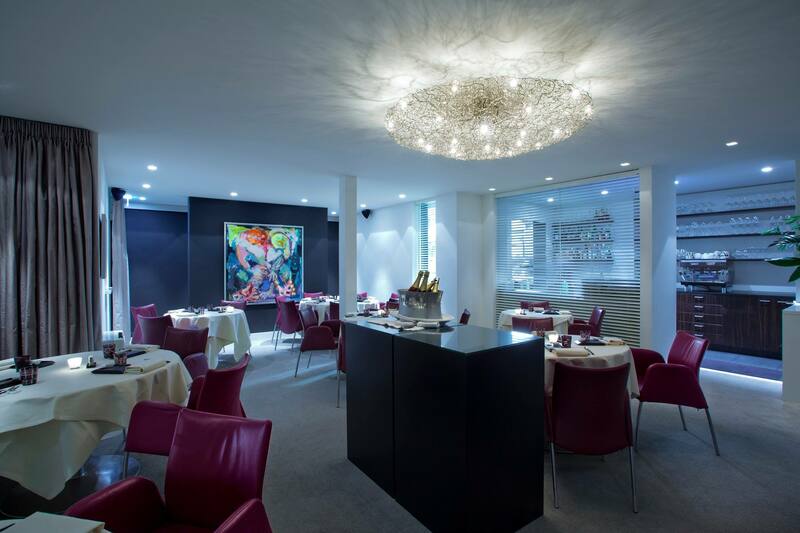 You can choose between a 6-course "Menu Toque Blanche" for €120 or the à la carte menu, where the main ingredient is served in two or three ways/dishes (starters €42.50 - €47.50, mains €52.50 - €110.00, desserts €18.50 - €22.50). At lunchtime (except on Sundays) the restaurant also offers a set "Business Lunch" menu, including tea/coffee and homemade friandises for €42.50, and there's also a 3-course "Soenil's Signature" menu for €52.50. I had lunch at De Lindehof with my husband and we both ordered the Toque Blanche menu. *I was recognised and the chef served me his signature Beef Rendang as an extra course. Waiting for us on the table were some thin and brittle tandoori-flavoured tuiles, accompanied by a corn espuma, sprinkled with chilli powder and black sesame seeds. Wonderfully creamy and intense espuma, with some nice heat in the finish, and lovely tuiles too, but they were so delicate and brittle that proper dipping was difficult. Shortly after, we were served three bite-sized appetisers. A tapioca cracker aka a cassava cracker had a delicious topping of finely chopped tomato, cucumber, red onion, and red chilli, with chaat masala seasoning, and garnished with three dots of coriander crème. 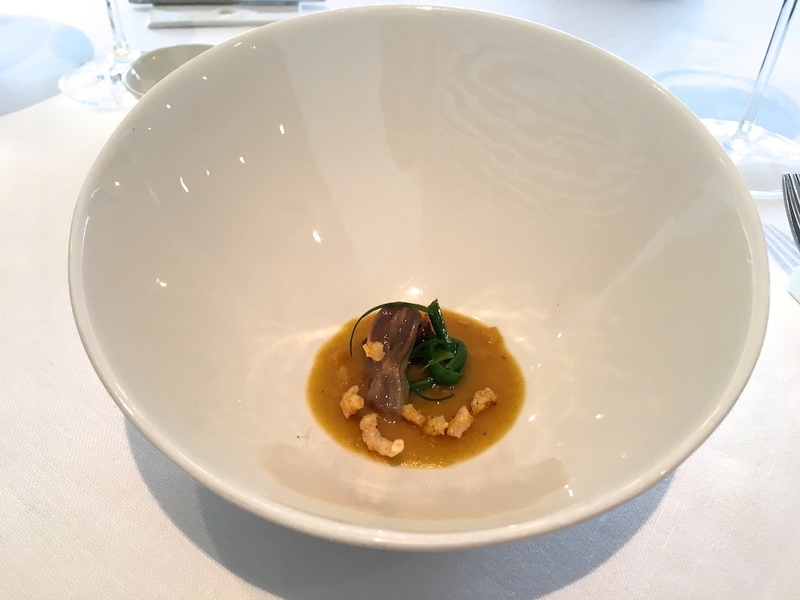 Served on a spoon was a moist and compact "nasi" cube, topped with an elegant peanut crème and a purslane leaf, and there was a delicious curry cracker with meltingly soft and spicy tuna and some curry mayonnaise. Three fantastic appetisers, all with a lovely long aftertaste, especially the curry and tuna cracker. Three more appetisers followed. First up was a sweet potato and ras-el-hanout bonbon, served with some chilli foam. A lovely bite, but the cocoa butter casing could have been a bit thinner. 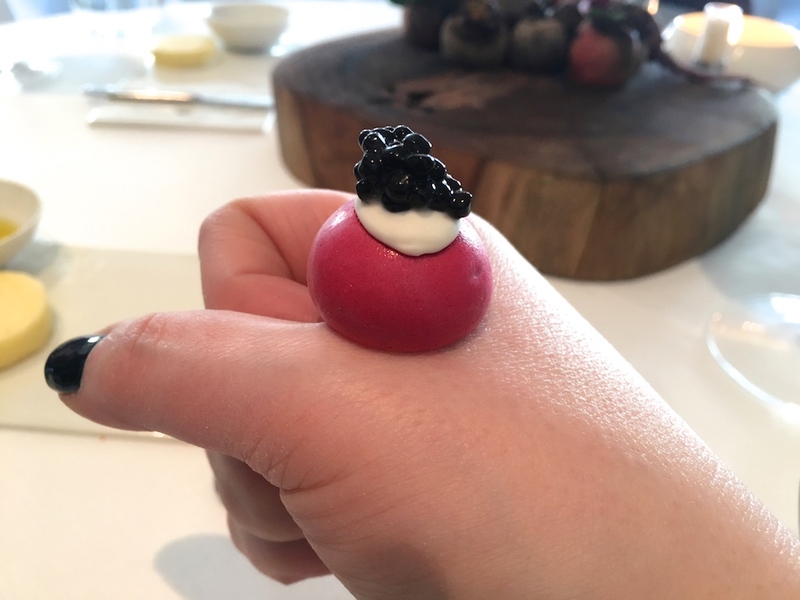 The next one, a beetroot meringue with crème fraîche, horeradish and herring caviar, was served on our right hands (in Hindustan culture it is custom to eat with your right, clean hand). 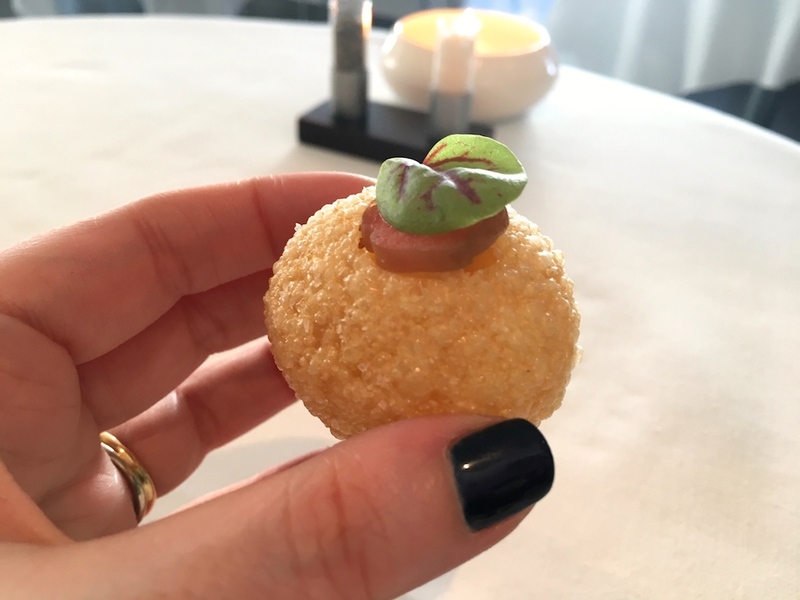 Finally there was an excellently made crisp soufflé (pani pouri or pani puri), garnished with birambi (a type of tangy Surinam fruit). 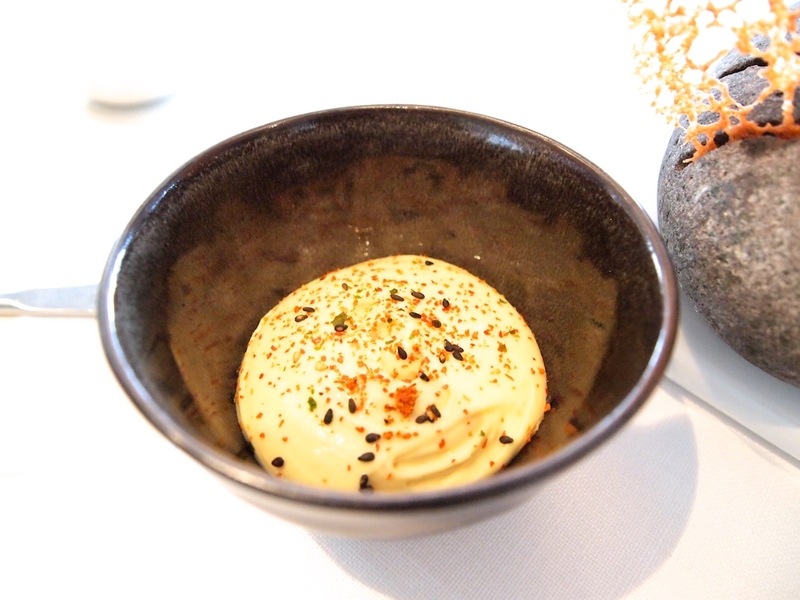 It was filled with an elegantly seasoned pumpkin espuma, with lovely warm spices and a touch of heat coming through. Shortly after, we were served a deliciously spiced dahl, made with yellow split peas, served with two pieces of duck, one crisp, the other one soft and tender, snake beans, and crispy potato bits. A nice and refined dish. 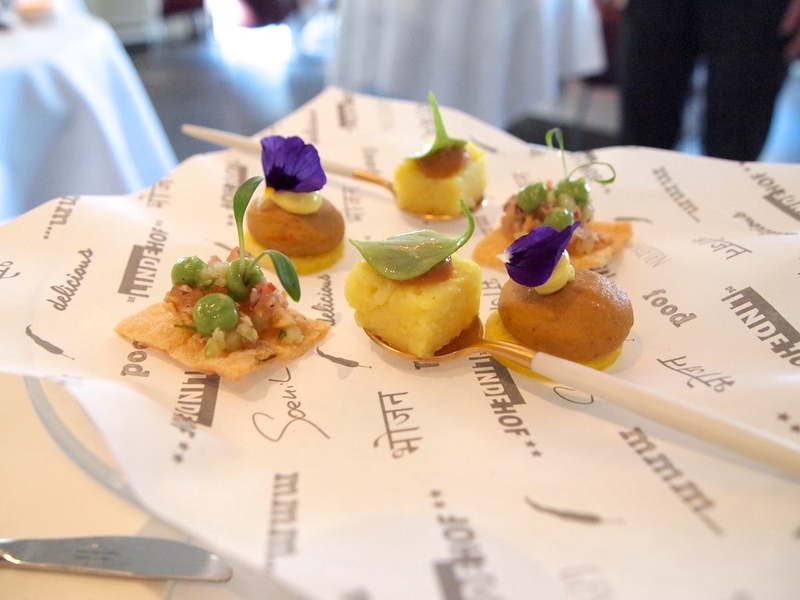 The last appetiser was barbecued chicken, marinated according to a secret recipe of Soenil Bahadoer's wife Esmee; delectable chicken served with two dips, a creamy vadouvan-spiced emulsion and a sweet and mildly spicy tomato salsa/chutney. A very pleasing combination. Time for the first course of the Toque Blanche menu. 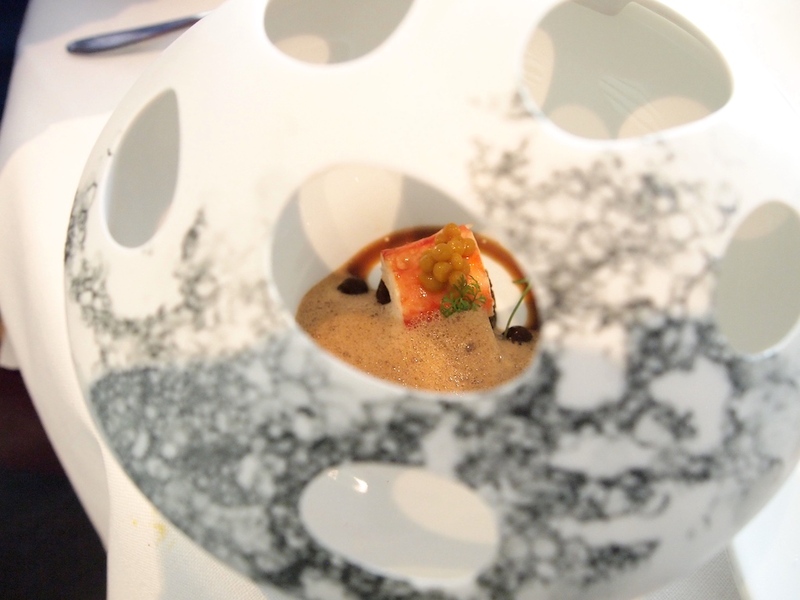 Northsea crab precisely decorated with avocado slices, little blobs of crème fraîche and black pearl caviar. 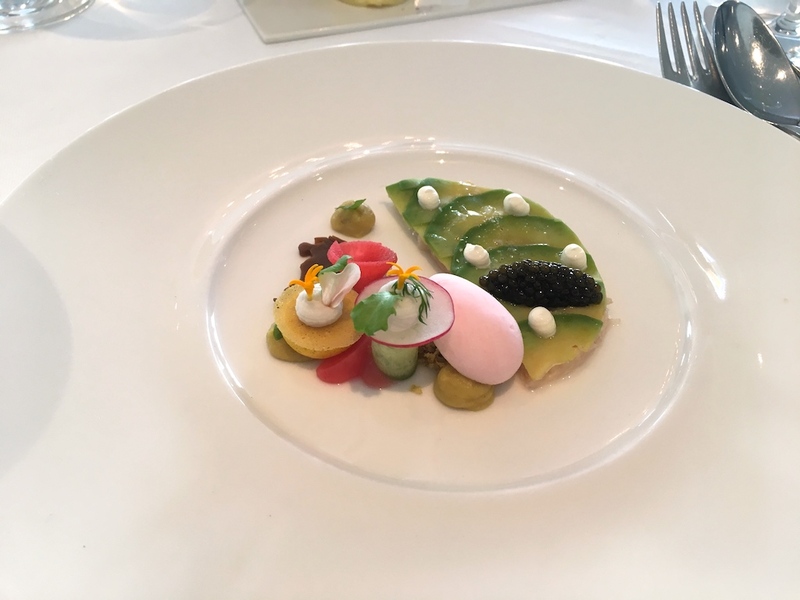 Also on the plate was some shore crab jelly, a little garam masala-flavour meringue, avocado crème, and various preparations of radish, including a magnificent, pure and mildly sharp, pink radish sorbet. Vibrant flavours with a great balance between brininess, butteriness and sharpness, and the addition of the sorbet added a nice temperature contrast to the dish. Even better was a side dish of king crab bursting with sweet, briny juices, placed on top of some (vegetarian) pointy cabbage rendang, and served with a foamy shore crab sauce. Big flavours delivered in a creative and sophisticated fashion and the rendang delivered a pleasant complexity to the dish, with distinctive rendang flavours coming through and a little bit of heat right at the end. Second course was an excellent piece of hamachi aka yellowtail, lacquered with soy, and served with some cooked quinoa, quinoa krupuk, tamarind jelly and an unripe mango salad lightly seasoned with warm spices. Fantastic, well-cooked hamachi, with a lovely buttery texture, its richness perfectly balanced by the tanginess from the tamarind and the mango delivering sweetness, sharpness and warmth. 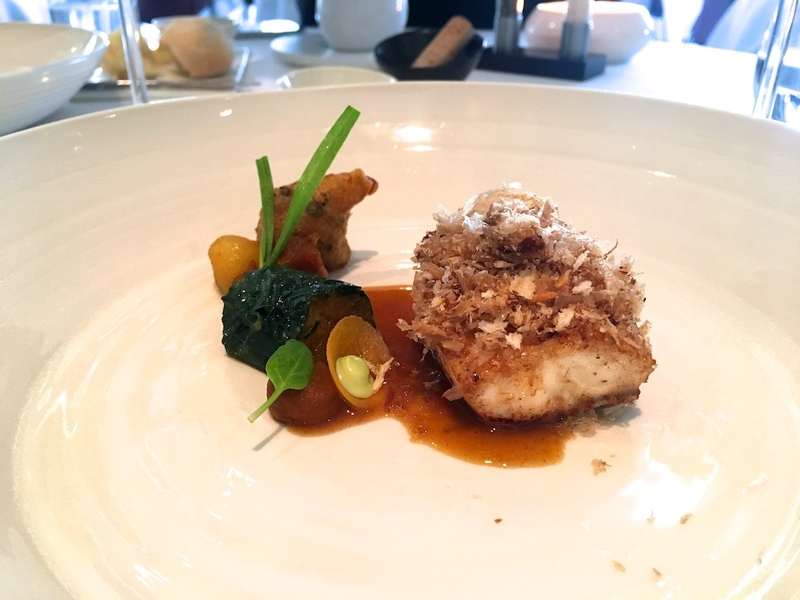 But I couldn't get enough of the next dish of succulent turbot topped with bonito flakes, teamed up with beautifully spiced pumpkin puree wrapped in a tayer leaf, a sublime apple and curry sauce, and a crisp bara, a popular Surinam snack made with split peas. 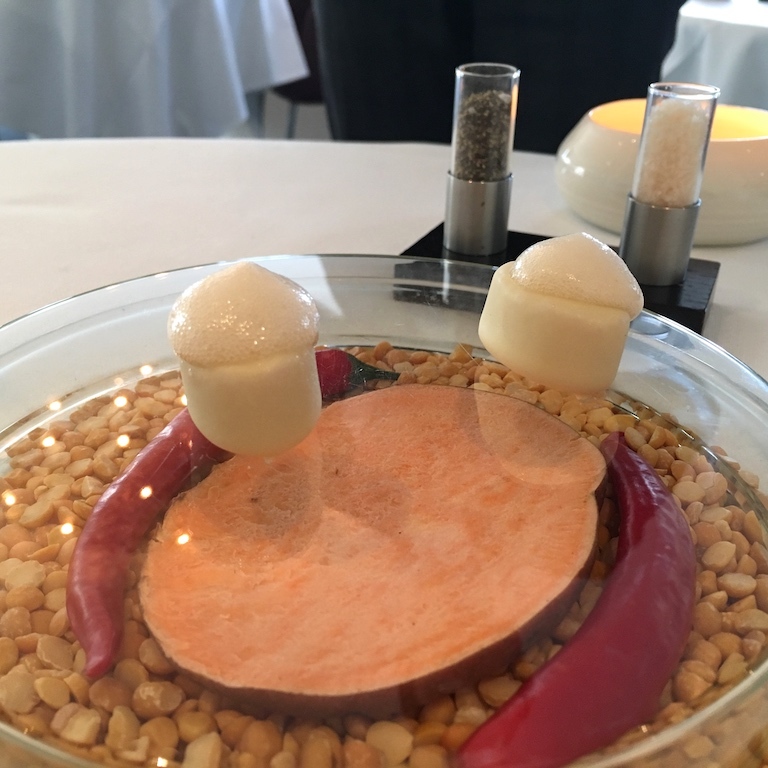 The spicing in this dish was exceptional, lifting all the flavours to another level, but I was equally impressed by the attractive level of sweetness, which was was perfectly balanced. 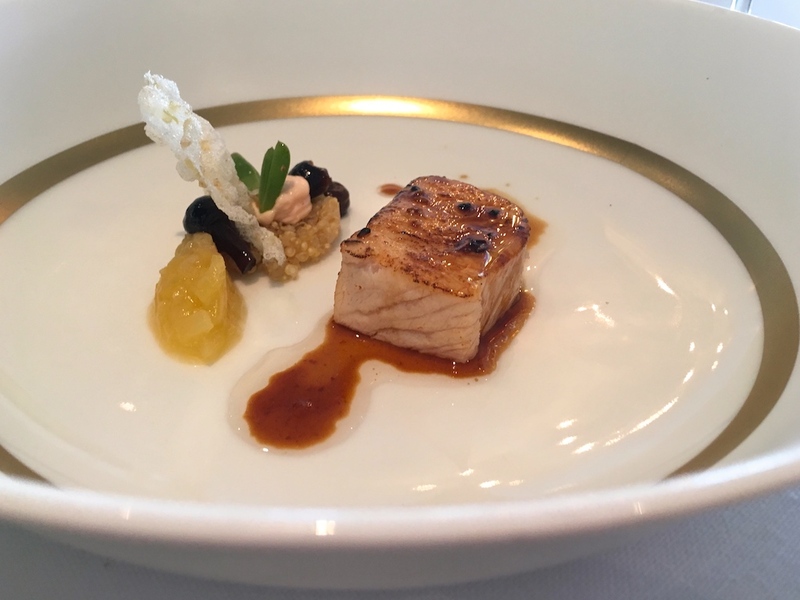 On to the fourth course, an indulgent yet light pairing of pork belly with a thin and crisp seaweed layer, lobster, a brunoise-cut mixture of carrot, celeriac, parsnip and onions described as "aromatics", a liquid dashi and ginger "bonbon", and a coconut and lemon verbena sauce. Seafood and pork have such an affinity for each other as they share a lovely sweetness, and the combination worked wonderfully. The delicately balanced coconut and lemon verbena sauce had well-defined flavours, and completed the dish. Beef rendang followed. 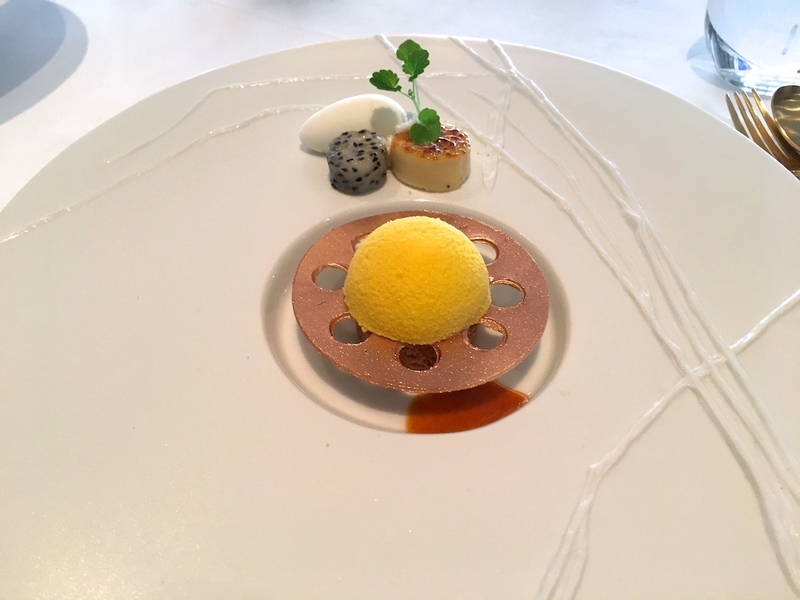 I had had this dish for the first time in March 2015, when I found it astonishing. In fact, I remember ordering a second serving there and then. Encore! 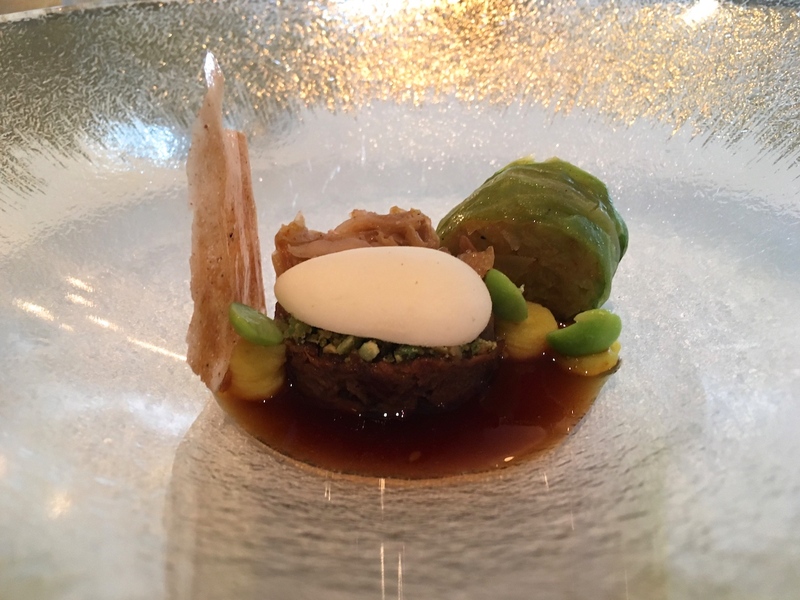 It's a truly distinctive and exuberant dish of beef rendang, served with a little quenelle of ginger beer ice cream, kimchi, savoy cabbage roll, potato and turmeric mousseline and a concentrated white soy sauce. An authentic beef rendang but then served in its most refined form, the warmth and spiciness of the rendang soothed by the ginger beer ice cream, which also made for a great temperature contrast. I could eat this all day. 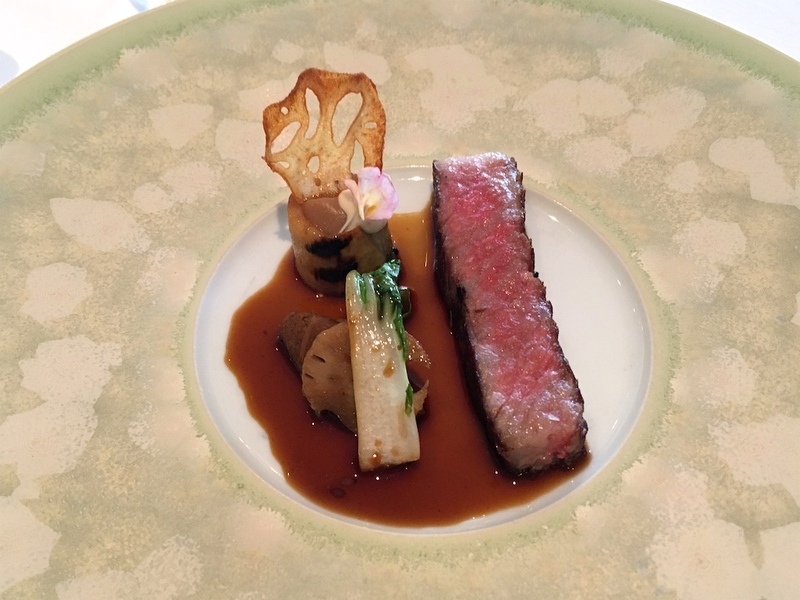 The meal continued with some deliciously rich wagyu beef, served with roasted heart of palm, a quenelle of finely chopped, soft heart of palm seasoned with a bumbu, some pak choi, and a lotus crisp. 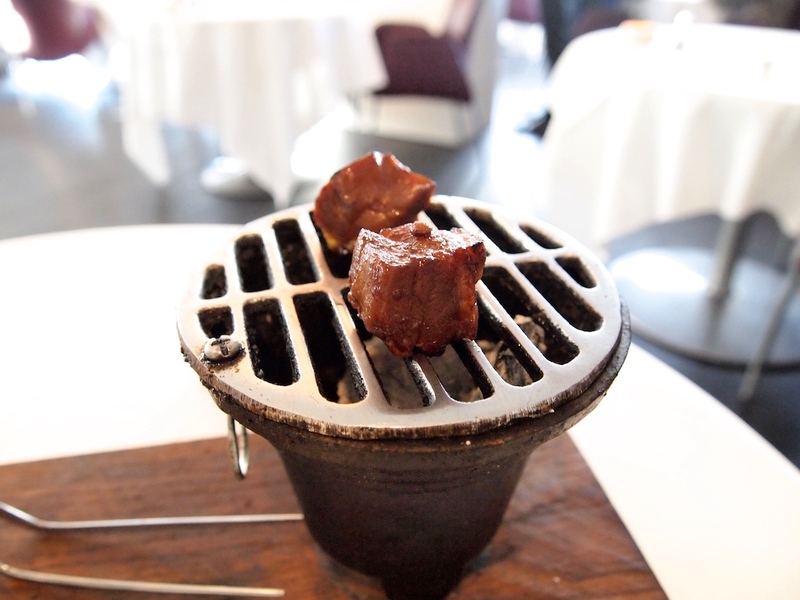 The sauce was a beef jus flavoured with sambai vinegar, which complemented the beef without masking its natural flavours. A very pleasing, wonderfully creative dish with very precise seasoning and a perfect balance between richness and intensity. Dessert was a combination of exotic fruits and yuzu. There was a pineapple and coconut bombe, placed on top of a bronze-coloured white chocolate disc and an almond biscuit cake. Arranged on the rim of the plate was some a nice and sharp yoghurt sorbet, a yuzu crème brûlée, yuzu gel, and a piece of dragon fruit. Highlight of the dish was a fabulous, exotic fruit sauce flavoured with tandoori spices, making this a deliciously different dessert that worked both in flavour and in texture. The only let-down in this dessert was the almond biscuit cake, which was rock hard. Van Gogh's early work in Brabant reflects the grey atmosphere and the then tough life of the peasants. His Nuenen paintings are no exceptions, with relatively sombre colours, particularly when compared to his later work. Soenil Bahadoer's food is anything but sombre; on the contrary, it is filled with the sunshine of a southern sun, a sunshine which Vincent only saw and started to paint when he travelled to Provence. A radiant and expressive cuisine reflecting Bahadoer's flair and Surinam-Hindustan heritage. This is displayed through his use of traditional Surinam ingredients and techniques, but most strikingly through a perfect blend and judicious use of exotic spices.